Coming to Cambridge Part 3. 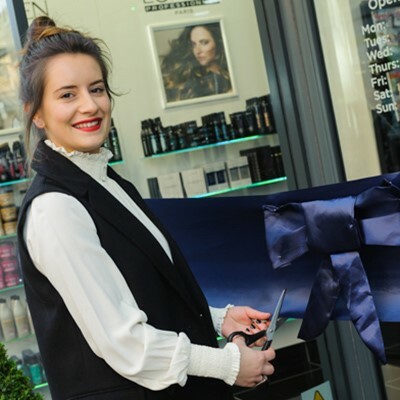 In the 3rd and final part of the Coming to Cambridge blog posts we catch up with Gentiana after she successfully opened her Rush salon in Cambridge at the end of November. The opening of Rush Cambridge was quite an eventful day, the salon was busy attracting lots of Christmas shoppers and passers by. The Rush Hair Heroes were on full force handing out balloons and goodie bags throughout town. All customers were treated to goodie bags, bubbly, cupcakes and exclusive opening offers. Gentiana cut the ribbon to her new salon, supported by a large crowd of friends and family as well as Rush Co-Founder Stell Andrew and Operations Director, George Phouli. Rush Cambridge looked beautifully festive with ornate Rush wreaths in the window and mini Christmas trees outside. The salon all came together in the end to create a chic black spacious salon, with glossy tiles and an indulgent relaxing spa room. So Gentiana, how does it feel to open? What are you most looking forward to with having your own salon? Rush is so unique to Cambridge, there’s nothing else like it. I’m most looking forward to seeing clients walk in and having an unforgettable experience with my team in Rush Cambridge. I am also so excited to work with my stylists and the young apprenticeship students to help them grow within the company to become amazing hairdressers. What is your new team of stylists like? The Rush Cambridge team is a fun, highly skilled group of talented hairdressers. My sister Agnesa is a huge support as the Front of House to help with salon management and maintenace while I can focus on working with my clients. We are a young and energetic team with bubbly personalities who are fashion conscious and able to advise each client on the ‘in’ hair trends. Cambridge has never experienced Rush before so there is a high standard we want to deliver to all our clients. We take great pride in what we do and are always looking to give the best service imaginable. I’m excited to have opened just before Christmas, it’s going to be a busy couple of weeks! The salon is in perfect location, on 24-26 Fitzroy Street right in the heart of the city centre next to the large Graftons shopping Centre. 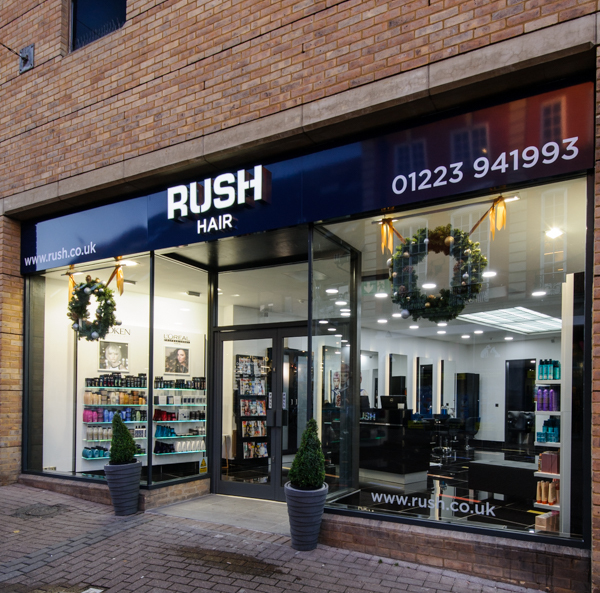 Rush Cambridge completes Rush’s busy year of salon openings and expansions across the UK, making it Rush’s 75th salon and the 12th and final salon opened in 2015. Coming to Cambridge Part 2. Careers in Hairdressing: What Can You Expect? Who won at the Rush Oscars 2016? How many salons did Rush open in 2016? Exclusive offers, news and a chance to win one of four £100 gift cards.